And now for Blueprint XVIV... the first time we've peered into the telecoms operations space. 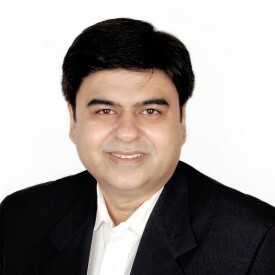 Pareekh, how do you see this market evolving and what are the key drivers for telecom services? We see telecom operations services evolving to the As-a-Service economy, where business processes of wireline and wireless operators across network, fulfillment, assurance, and billing are being delivered as BPaaS on specialized technology stack. Social, mobility, analytics, cloud, and automation (SMACA) solutions are driving this as-a-service transformation of telecom operations services across both wireline and wireless. The telcos are facing four major challenges in their current operating environment. First, is the competition from the Over The Top (OTT) players such as Whatsapp, Skype, etc. which are denting the telcos' revenue. Second, is new 4G/LTE rollouts for wireline operators and FTTx rollouts for wireline and broadband operators. Third, is high customer expectation of superior customer experience and support. Finally, is the rollout of new services. SMACA solutions provided by telecom operations service providers can help telcos to mitigate these challenges by opex reduction, capex efficiency improvement, time to market improvement, churn reduction, omni-channel customer engagement and support, and helping telcos to offer predictable and agile services. We focused our Blueprint analysis on the evaluation of SMACA solution capabilities of different telecom operations service providers. This may sound clichéd, but we will call all seven service providers evaluated as winners. The reason is that we focused on evaluating SMACA capabilities and insisted on actual SMACA solution case studies in telecom operations services. We started with a long list of telecom operations service providers but realized that most of the service providers have not yet developed these offerings. Only seven service providers could withstand our scrutiny and evaluation. Ofcourse, there is relative positioning among these seven service providers. There are three service providers in our Winner's Circle - Accenture, TCS, and Tech Mahindra. Four things are common across all three Winner's circle service providers – telecom specific SMACA offerings, strong IT and BPO synergy validated by customer case studies, experience in delivering innovation or value beyond cost validated by customers, and strong and compelling digital vision exhibited by their initiatives, plans and PoCs. 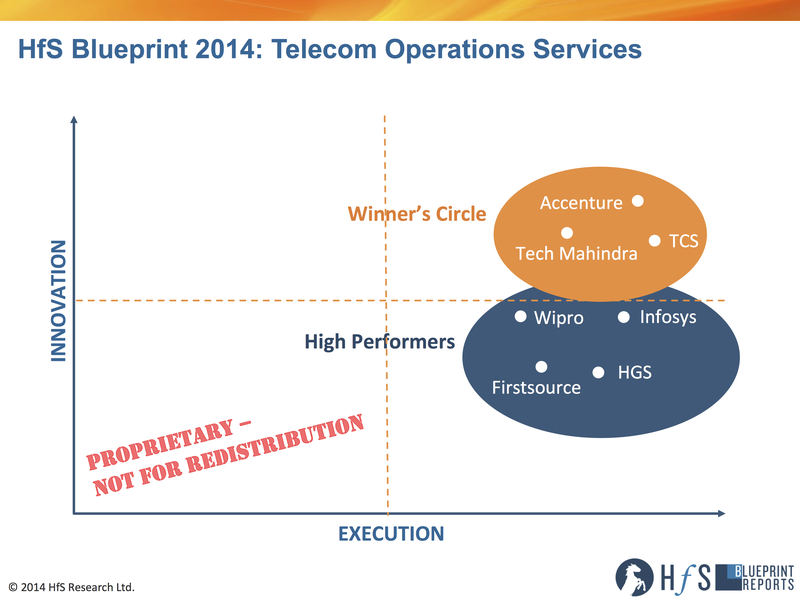 The four High Performers in our study are Infosys, Wipro, HGS, and Firstsource. They are on the right path and will strengthen their telecom specific SMACA offerings and capabilities in coming months. We think there are three key takeaways from this study. First, the SMACA solutions are for real. Second, "design thinking" can be used as an innovation tool. Finally, the SMACA solutions can be leveraged in broadening client base and solution offerings. 1. The SMACA solutions in Telecom operations services are for real. We are able to separate signals from noise by analyzing numerous case studies along with PoCs that convince us of the presence and applicability of SMACA in this market segment. The contract size for SMACA solutions is small today, but it has potential to become big in the future. 2. In telecom operations, HfS came across a number of examples of "design thinking," where observation of frustration points amongst telcos’ external subscribers, and within a telco's internal workforce led to the innovative solutions. As process improvement is running out of steam, "design thinking" can be source of value realization and emergence of new business and delivery models not only in telecom operations services but in whole "As-a-service" ecosystem. 3. There are about 700-800 telcos in the world, but only about 100 or so tier 1 telcos in selected countries have embraced outsourcing of operations services. Now there is an opportunity to provide services to tier 2 and tier 3 telcos too leveraging SMACA solutions. A few service providers have started to move up and expand their scope of services beyond IT and operations, offering network services and business advisory services leveraging SMACA. These were once the exclusive domain of telecom equipment providers and management consulting firms. We will watching in coming months and years, how winners consolidate their positions and other service providers develop their SMACA offerings in telecom operations services. Also, as telecom operations services move towards "as-a-service," we will be watching for "as-a-service" contracts, emergence of specialist service providers, and deployment of new business models. Pareekh, thanks for taking the time to share your new research, another great effort from you! HfS readers can click here to view highlights of all our recent 19 HfS Blueprint reports. HfS subscribers click here to access the new HfS Blueprint Report, “HfS Blueprint Report 2014: Telecom Operations Services"